is great. Of course the modernist types have been doing that to Tolkien since 1954. I take the fact that the movies are getting this type of reaction as a positive sign. It means they may actually be reflecting the book properly ! I read this in my hard copy of Adoremus Bulletin, then found it online. The first thing that popped into my head ? There's a fuss over crèche parking. Now the signs can't acknowlege that people are coming there to see the crèche. Ah, well, it's worth the fuss. If you are in Pittsburgh before January 6, this nativity scene is definitely worth seeing. The picture on the site simply cannot do it justice. is today. There's information on him here . Blessings on Fr. Drew of the Oratory on his name day. God's Ways not Our Ways - Venerable John Henry Newman, C.O. Quia hæc locutus sum vobis, tristitia implevit cor vestrum. Sed ego veritatem dico vobis. Expedit vobis. Because I have spoken these things to you, sorrow hath filled your heart. But I tell you the truth: it is expedient for you. 1. O MY Saviour, I adore Thee for Thy infinite wisdom, which sees what we do not see, and orderest all things in its own most perfect way. When Thou didst say to the Apostles that Thou wast going away, they cried out, as if Thou hadst, if it may be so said, broken faith with them. They seemed to say to Thee, "O Jesu, did we not leave all things for Thee? Did we not give up home and family, father and wife, friends and neighbours, our habits, our accustomed way of living, that we might join Thee? Did we not divorce ourselves from the world, or rather die to it, that we might be eternally united and live to Thee? And now Thou sayest that Thou art leaving us. Is this reasonable? is this just? is this faithfulness to Thy promise? Did we bargain for this? O Lord Jesus, we adore Thee, but we are confounded, and we know not what to say!" 2. Yet let God be true, and every man a liar. Let the Divine Word triumph in our minds over every argument and persuasion of sensible appearances. Let faith rule us and not sight. Thou art justified, O Lord, when Thou art arraigned, and dost gain the cause when Thou art judged. For Thou didst know that the true way of possessing Thee was to lose Thee. Thou didst know that what man stands most of all in need of, and in the first place, is not an outward guide, though that he needs too, but an inward, intimate, invisible aid. Thou didst intend to heal him thoroughly, not slightly; not merely to reform the surface, but to remove and destroy the heart and root of all his ills. Thou then didst purpose to visit his soul, and Thou didst depart in body, that Thou mightest come again to him in spirit. Thou didst not stay with Thy Apostles therefore, as in the days of Thy flesh, but Thou didst come to them and abide with them for ever, with a much more immediate and true communion in the power of the Paraclete. 3. O my God, in Thy sight, I confess and bewail my extreme weakness, in distrusting, if not Thee, at least Thy own servants and representatives, when things do not turn out as I would have them, or expected! Thou hast given me St. Philip, that great creation of Thy grace, for my master and patron—and I have committed myself to him—and he has done very great things for me, and has in many ways fulfilled towards me all that I can fairly reckon he had promised. But, because in some things he has disappointed me, and delayed, I have got impatient; and have served him, though without conscious disloyalty, yet with peevishness and coldness. O my dear Lord, give me a generous faith in Thee and in Thy servants! here ...just when my page is giving me problems. Sigh. I have limited computer access today, plus I seem to be having some technical problems with my archive. Mr. Dreher sometimes drives me up the wall. However, this is a fine article on a tragedy I don't remember hearing anything about in the national media. Of course, I seldom watch, listen to, or read the national media, so it may be I'm merely missing the story there...but I doubt it. Talk about a December to remember ! Blogs4God asked us to send in little lists of things for which we thank God. 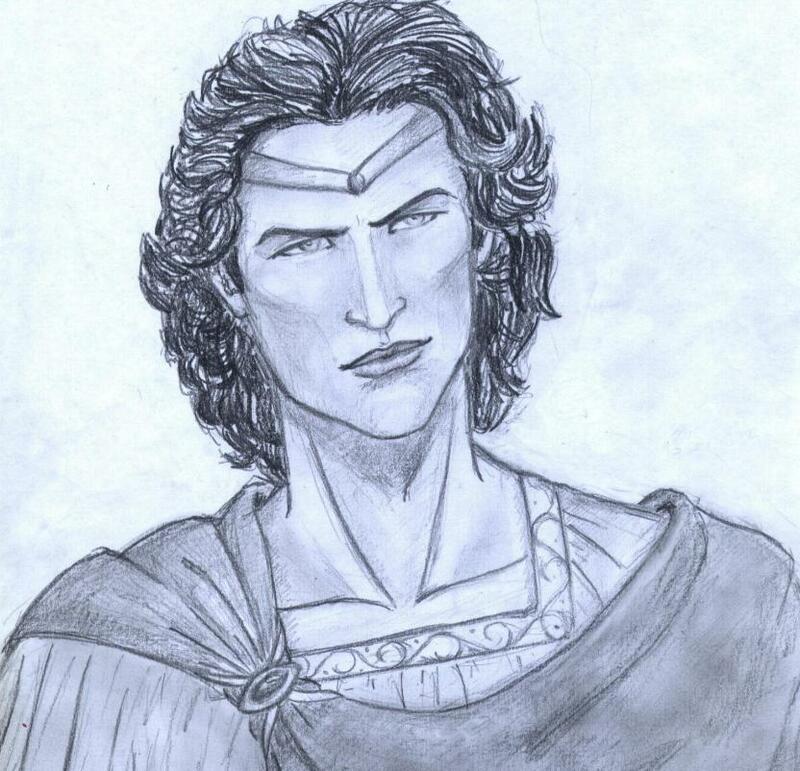 For the people I see reading Tolkien on the bus..
Somebody actually posted a drawing of Fëanor that somewhat resembles the picture I have in my head. I found this on Rolozo Tolkien . Finding a decent picture of the Head of the House of the Dispossessed is not that easy. Processional Hymn: "All Hail the Power of Jesus' Name"
Recessional Hymn: "To Jesus Christ, Our Sovereign King"